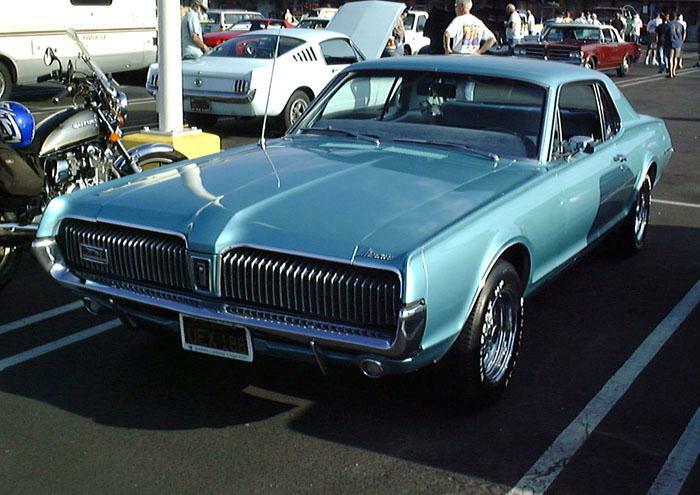 The original Mercury Cougar was a Ford Mustang spin-off. The sleek notchback coupe's full-width front grille and sequential taillights made it a standout and it was named Motor Trend Car of the Year for 1967. An uplevel XR-7 model, with richly detailed Euro-style interior, arrived mid-year. A 200-hp 289 V-8 was standard, with a 320-hp Marauder GT 390 available, with or without GT performance package. For 1968, a 302 V-8 was standard, but that year's singular GT•E package initially included a 390-hp 427 — replaced late in the season by a 335-hp (wink, wink) Cobra Jet 428. A XR-7 G (Gurney) special appeared mid-year. Longer, wider and heavier, the 1969 Cougar featured newly sculpted styling and curved side glass, sans vent windows. A 351-cid V-8 was now standard. The newly introduced Cougar convertible was offered in standard and XR-7 models. Bold graphics and bright colors marked the 1969-70 Eliminator, which offered powerful 428 CJ and Boss 302 Trans-Am V-8 engine options. Today, well-documented high-performance Cougars can be pricey, while standard power train examples, including 1969-70 convertibles, are relative bargains. Click here to read Hemmings Motor News' Buyers Guide for the 1967-1968 Mercury Cougar.